The original Tron was released in 1982. I had barely been born at the time. I first watched it on TV, when I was a young and impressionable boy and I remember enjoying it. I recently re-watched the original to refresh my memory when the sequel/remake came out. It turns out that this wasn’t necessary as the new film, while ostensibly a sequel, is understandable by anyone who hasn’t seen the original. Or at least, its level of understandability is not affected much by whether or not one has seen the original. The plot is essentially exactly the same making this film a sequel and a remake all at the same time. In fact it is surprising how little has changed in 28 years. There is one significant difference though – the new film is not quite as good. The special effects have certainly improved. The way the movie is set up gives cgi directors the perfect excuse to showcase their art. In addition to this, the new film makes use of 3D glasses which adds yet another dimension (quite literally) to the film. The implementation of 3D was actually quite well-handled because the film makers didn’t use it all the time. Scenes in the “real world” were shot and displayed in 2D while those in the computer world were in 3D. The transition was also quite well-handled and the feeling it gave the viewer was reminiscent of the scene in The Matrix where Keanu Reeves’ character first wakes up from the Matrix and things are slightly confused. Unfortunately the makers of this film dedicated too many resources to making the film look cool. It does look very cool, but one can’t help thinking that more effort could have been spent on better dialogue, more character development, and possibly an original plot, or at least one that wasn’t exactly the same as in the previous film. There are plenty of textual references and small-scale sight gags which remind older viewers of the original film. Indeed there are many references to the original, although it would have been nice (and friends of mine who are fans of the original also agree) to see more of the character Tron, who sadly only makes a few fleeting appearances. The strongest thread linking this film with the original is, of course, Jeff Bridges. It is also with Jeff Bridges that one of the few original ideas of this film is manifested – there are two of him. One is a clone computer program who he created in his own image (and who doesn’t age) to assist him in building the perfect system, and the other is an “old” (current) version of himself. In Jeff Bridge’s computer clone is probably also the best “special effect” of the whole film, and that is the recreation of a young Jeff Bridges. It is no secret to anyone who I’ve spoken to about this film that I feel that Bridges carries the whole film. If Jeff Bridges wasn’t in the film, I don’t think I would have bothered watching it. The main guy, I forget his name, has laughably poor screen presence although some better direction and writing certainly would have helped. It was just difficult to take him seriously after he is sucked into the computer program, and then first sees his father, who he hasn’t seen for 20 years and believed dead, and displays only the slightest hint of an emotional reaction. The token female role this time is played by Olivia Wilde, who I admit is the other reason I went to see this film. She is quite pleasing to the eye, make no mistake, but a great deal more should have been done with her. She has screen presence, and isn’t devoid of acting skill. She was however somewhat lacking in good lines throughout this film and her character’s lack of character did not make up for how well she wore her tight-fitting outfit. The “look” they gave her was also strongly reminiscent of Leeloo from Luc Besson’s masterpiece The Fifth Element. Milla Jovovich fortunately had a lot more acting to do in that film. In short, don’t watch this film just to see Olivia Wilde look hot, you should watch an episode of House instead. Also look out for Cilian Murphy who plays the role of Ed Dillinger’s son in the new film (it would have been nice to see more of his character, but sadly that all fell into a plot hole). Another notable cameo appearance is from Steven Lisberger, the writer/director/producer of the original Tron movie, making a brief appearance as a bartender. One wonders why they didn’t ask him to play a more significant role in the remake. Instead, the direction of this film was entrusted to Joseph Kosinski who has never before directed a feature film, and the main writing credits go to two people whose names I cannot recall (and don’t wish to) who have only ever written for TV series’. Sure, there have been many first-time directors who did very well (such as Hugh Hudson on Chariots of Fire) but why they would do this on the 20-year-sequel to one of the largest cult film franchises in history is beyond me. Plot holes abound, there is no MCP, and the light bikes don’t do 90 degree turns anymore. Olivia Wilde is hot, but not that hot, the CGI is cool, but not that cool, and the 3D is not enough to lift the flat mood and texture of the film into “watchable” territory. Jeff Bridges carries the film that I didn’t expect much from, and got even less. Even the subtle references to the old film aren’t that great (check out the posters). If you get to see it for free, or very cheaply on a night when you’re really bored and there’s no curling on TV, then see it. Otherwise… you’re better off renting the original and being amused by 1982’s idea of cutting-edge special effects. 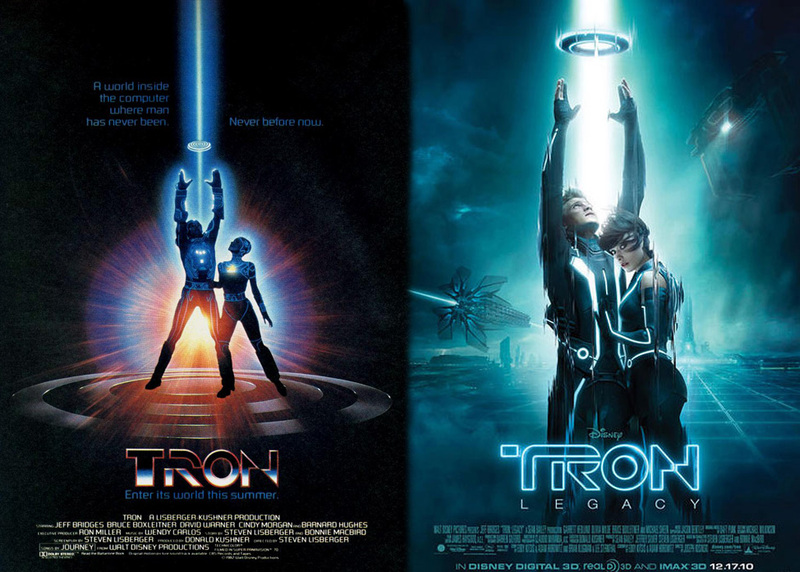 The poster from the 1982 and 2010 films side by side for comparison.